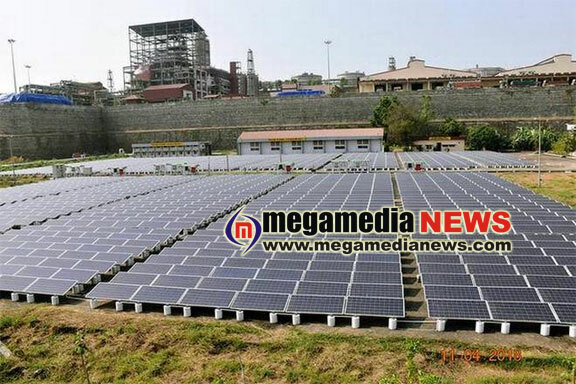 Mangaluru: Mangalore Refinery and Petrochemicals Ltd., (MRPL) has clocked a major milestone by commissioning 6.063 MWp solar power project on its premises, the largest at any refinery site in the country. The oil refining major has installed solar panels on as many as 34 locations, including roof tops – RCC as well as sloping sheet steel roofs, atop water storage plants etc. MRPL has spent ₹27 crore to bring the project executed by M/s Tata Power Solar Systems Ltd. The project delivers about 24,000 units of power every day, that is, about 8.8 million units a year. The refinery has an installed capacity to produce 234 MW power on its premises. The solar project results in an annual savings of about 2,680 tonnes of oil equivalent and reduction in CO2 emissions by about 7,000 tonnes, said a release from the company here. MRPL said the project demonstrates its commitment to sustainable development with focus on reduction in carbon emissions and renewable energy generation.